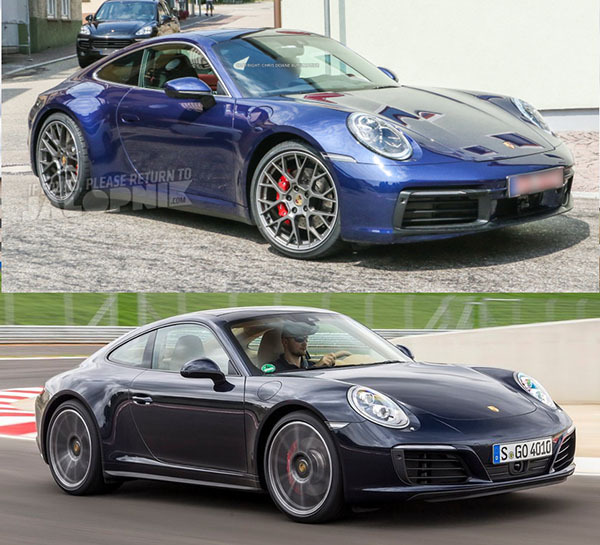 I do like the fact that no matter what, a new Porsche 911 always looks like a 911. At a glance, they just look the same. Of course, the bumpers, mirrors and other things look a bit new. But this does not look like an all new model. And now there seems to be way to much cheap looking black plastic on the front bumper too. Head over HERE for many more shots of the 2019 Porsche 911. It will be fine. The taillights are obviously different. There is still camo on the headlights and probably on the front number. The back looks hideous. Vertical grill, wrap around tail lamps. Change for the sake of change almost always leads to unnecessary details. While I like the newly scalloped hood up front (which subtly reminds me of the 1970s 911/912 models), the retro vertical decklid louvers make the rear end look narrow and awkward. If you are willing to lease a 911@1,500@ month or buy one $120K, I am impress. A 911 GTS!, super impress! All 911 look identical to me! Was going to make same comment as above... I'm glad they brought back those hood creases. The Jalopnik article says it's bigger. So perhaps that's difficult to perceive in the photos.